Wolfs' Books: Plato, Politics and Eugenics - Space Viking, A Book Review. For centuries the men of the Sword Worlds have preyed on the soft helpless inner worlds, and in a pattern as old as human history have built a new civilization from the wreckage of the old. Only one Sword-Worlder, Lord Trask of Trask, has spoken out against the continuing depredations - not from pity for the old, fallen worlds of the dead Federation, but from the fear for his own. For more and more of the Space Viking are refusing to return to their home planets, preferring instead to stay and enjoy the fruits of conquest: just as once the strongest and the brightest of the Federation forsook their home planet for adventure and profit, so too the Sword-Worlds are being bled dry. This s the story of Lord Trask, who began as a voice of peace and reason - and ended as the greatest Space Viking of them all. As a teenager I loved this book and read it often. It is a classic space opera with fast paced action scenes and a good dash of empire building as well. It also contains some politics, but it is simple and easy to follow, not like C.J. Cherryh’s Chanur Series, which gave me a headache and slowed the pace of the novels somewhat. What I liked was that it was a nice easy read, one that you can revisit over the years and still enjoy. I love coming back to it and reading the archaic references from the technology used on a space ship to cultural ones like relaxing with a pipe to smoke. The space battles are fast paced and once again use, what we would now think of as archaic technology, no beam weapons or energy shields, it's all physical. Specially created metal shields, missiles and cannons that shoot projectiles. What I also like is the character development of some of the main characters. The principle protagonist, Lucas Trask starts off seeking vengeance on Andre Dunan, the man who shoot up his wedding day and killed his bride. On the way he transforms from Viking to Merchant to King and, towards the end, seems a little annoyed that his vendetta against Dunan is hampering his efforts to create a trade alliance with several of the planets he was formerly raiding. "He wasn't planning any raid; he was planning conquest, in the only way a great civilization can be conquered—by subversion." Some reviews of this book discuss Plato's theory of civilization rising and falling back into barbarism, as the basic premise of the book and compare it to what has happening in Western society today and at the time that Piper wrote the book. Me, I can see that if I squint, but I've always loved this type of story, rising from the ashes, boot-strapping civilization, type of thing. One of the reasons why I liked Day of the Triffids as well. There's something wrong with democracy. If there weren't, it couldn't be overthrown by people like Makann (a Hitler-Type), attacking it from within by democratic procedures. I don't think it's fundamentally unworkable. I think it just has a few of what engineers call bugs. It's not safe to run a defective machine till you learn the defects and remedy them. Up until this point Piper seemed to favour a Feudalist system, but while explaining that democratic rule of the people is silly, goes on to explain that in a feudalist system the people allow their overlords to rule them !? However it looks like Piper just doesn't think any form of government is workable. It may just be," he added, "that there is something fundamentally unworkable about government itself. As long as Homo sapiens terra is a wild animal, which he has always been and always will be until he evolves into something different in a million or so years, maybe a workable system of government is a political science impossibility. What a deeper discussion about Space Viking? This is only a small part of the novel and the rest is a good story of overcoming the odds to raise other planets up to a higher tech level and create a booming economy. The sort of sci-fi story I loved as a boy, and still enjoy today. If you are interested in an in-depth discussion of the politics, eugenics and other factors that lie behind the story I would recommend reading through the blog post “Yakking about who's civilized and who's not”: H. Beam Piper's Space Viking and the comments on the Tor blog. 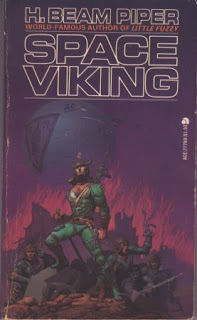 All up, I really enjoy reading through Space Viking, more so than any of H.Beam Pipers stories, and it is a book I continue to return to often. If your interested in reading it for yourself, you can download the e-Book for free at Project Gutenberg. My quick review - Link here. All H. Beam Pipers works on Project Gutenberg- Link here. If you want to support Wolf's Books, use the links below and I may get a small commission. Which I will promptly use to get more books! Interested in H.Beam Pipers writings?